Criteria: 2014 Rock and Roll Hall Of Fame Inductees. Names are in alphabetical order. Yeah, you guessed it. The Rock and Roll Hall Of Fame is at it again, in their ongoing efforts to deny the existence of blacks in rock 'n' roll, despite inventing the very idiom itself. Now with their most recent election they've continued their long-dreamed of attempt to turn the institution into something resembling Alabama in the early 1960's. Don't mind the snarling attack dogs that will patrol the outskirts of the Hall, or the decorative nooses hanging from the trees out front, as long as you're white you have nothing to worry about. Rest assured, rock 'n' roll is still for you, they drawl. Consider it your own private domain. Before long all remnants of its origins will be eradicated from memory. There'll be no rhythm to distract you, no backbeat to rattle your eardrums and no dark faces to give you nightmares. The Rock and Roll Hall Of Fame - preserving white delusions, one sickening lie at a time. So once again we're back in the same foul-smelling mud hole as years past. Another year, another abject failure on the part of the Hall. For the third time in their history the induction class is entirely white. Since 1997 in fact, 69 percent of the nominees and a staggering 75 percent of the inductees are white. The overall rates since the Hall opened its doors in 1986 are equally disturbing. Fifty-three percent of the total nominees are white, which is reasonably fair, but 63% of the inductees are white, meaning they have a ten percent increased likelihood of getting in, a staggering number in statistical probability terms. By contrast black artists see a ten percent drop in their chances from nomination to induction, despite being nominated less to start with. This is for a music invented by blacks for black audiences and whose stylistic evolutions within the field, including soul, funk, disco and hip-hop, are among the most far-reaching, popular and influential of rock's many subgenres. Somehow the Hall Of Fame forgot that minor fact. But we're not supposed to talk about that, are we? No, this is the time to celebrate those who got elected, despite half of them falling well short in objective criteria compared to those left out that mere terms such as "incomprehensible" doesn't do these results justice. Reprehensible, though sadly predictable, is more like it. Statistically speaking there's never a very good chance the Hall will get every selection right every year. With six choices from 16 candidates however the reasonable hope is that they choose the five most deserving artists with the sixth being at least tolerable. If only four of the most deserving get in the questions start to arise and less than that is cause for concern if not downright outrage. This year? The most deserving candidate, Nirvana, breezed in. That's where the sanity and common sense ended. After that it was merely a disaster. The next three, or if you want to be overly generous, three of the next four who score the highest using any reasonable objective measures, failed to make it and there's no question that once again race played a huge factor in the votes. Consider: N.W.A, who nearly rival the headliners from Seattle in terms of influence and impact, creating gangsta rap, the most explosive, controversial and dominant new direction in rock in years, inexplicably failed to get inducted in their second attempt on the ballot. Only one other candidate each year could be said to sport better credentials and yet 10 less deserving artists have elbowed them aside in that time. Then there's LL Cool J who broke new ground stylistically as a teenager, setting trends musically and otherwise along the way, all while sustaining unprecedented popularity in a field that has a notoriously short memory when it comes to street credibility. He then successfully crossed over into a much broader all-around entertainment persona which few artists from any area of rock have been consistently able to do, but somehow he fell short yet again as well. Meanwhile, all Chic has on their résumé was defining the most dominant commercial musical style of their era while being universally acknowledged as a) the best songwriters, b) the greatest band and c) the most successful producers of that time, making music whose influence is still prominently felt more than three decades later, as evidenced by Nile Rodgers guest appearance on the Chic-inspired mega hit "Get Lucky" by Daft Punk this summer. But that's not good enough apparently. Everyone who considers themselves a music lover should be equally outraged if they care at all about the Hall Of Fame being a legitimate reflection of rock history. Whether or not their own personal tastes are being ignored or if those tastes are well represented, the fact remains that the full scope of rock has to be accurately depicted for the Hall to matter. When any one era, style or culture is consistently neglected, despite having objective career achievements that tower over the majority of the inductees each year, then the Hall Of Fame needs to be criticized. Collectively those rejected candidates all have indisputable credentials, the only kind which should matter in evaluating who is and isn't deserving of immortality. Success, impact and influence. Yet apparently it was none of those things that were being looked at by the voting body, who, as becomes increasingly obvious, use their limited familiarity and narrow individual tastes when deciding on whom to elect. Also falling victim to this indefensible voting methodology was Deep Purple, who edge out The Meters and Link Wray for the next most deserving overlooked name on the ballot. While the motives on the surface were different, Deep Purple were white after all, the underlying reasons remain frighteningly similar – the voting constituency does not seriously consider musical styles they are uncomfortable with if they can at all help it, and heavy metal innovators, even if they come from their preferred era, are seen as unfit for enshrinement. Thus of the nine most deserving candidates on this year's ballot based solely on their objective career achievements, seven were left out. You'd be hard pressed to do a worse job selecting artists if it were done by picking the names out of a hat while blind drunk. But put down that bottle and hold on to your hat, for here are those names all the same. The second selection for Gabriel, who also made it in a few years back with his original group Genesis. Considering how long they had to wait for a deserving induction it is surprising that Gabriel's solo career which, while always interesting and challenging, was rewarded so soon after. Of course he, as an earlier inductee, gets a ballot and is therefore allowed to cast a vote for himself, another shameful quirk the Hall is guilty of. Yet most disturbingly Gabriel's second entry is another example where a certain type of artist - a Caucasian hailing from the 70's whose work is most appealing to literary minded critics and who shares a background with a large majority of previous living inductees who naturally vote for their friends and peers – is rather unjustly rewarded. Now Gabriel's not without credentials, he constantly sought new artistic directions and was one of the most notable devotees of "world music", as well as an innovative artist when it came to using music videos, all of which are strong attributes in his favor. Yet he scored just two Top Ten Albums and two Top Ten Singles in the U.S. (better in the U.K., especially with albums), and much of his influence, including creative staging for live shows, comes from his years with Genesis, who have has already been honored by the Hall. In the end it's not the fact that he got in at all that raises questions, it's that he got in over four, perhaps even as many as six, more deserving candidates on this year's ballot and the reasons behind it that is troubling. Ever since rock crossed into white culture the dominant music critics of the day have always been inherently more comfortable extolling the virtues of white artists who attempt to mimic black acts than they are celebrating the originators. Hall & Oates represent just such an example. Their love of the vocal and arranging styles of Motown artists became their starting point, but their exquisite song craft and abundant vocal skill was their own, and along the way they became the most popular duo on the U.S. Pop Charts of all-time. As such their induction is not just deserved but overdue. Their image had taken a hit following their heyday, viewed as too pop perhaps, and the cheesy mustache John Oates sported in their heyday couldn't have helped that image either in retrospect, but here again the voters are more accepting of black styles when they're slightly watered down for their ears. They themselves have absolutely nothing to be ashamed of, either for their style itself or their induction. They were among the most unjustly overlooked of long-eligible candidates and by rights they should've been on the ballot years ago for their extraordinary run of hits that lasted over a decade, but it's still rather odd that they get in on their first crack at it while many of the artists they idolized get passed over year after year. Another group that was deserving long ago but their cartoonish image and the constant self-promotion of outspoken founder Gene Simmons turned many people off. At one point in the 70's the KISS Army, their legion of teenage fans, was millions strong, as notebooks, lockers and desktops in schools across America had their name or elaborately made-up faces drawn on their surfaces. They were among the top touring groups of their era and under Simmons savvy direction they raised crass commercialization of their image to undreamed of heights and monetary reward, from comic books and Halloween costumes to pinball machines and believe it or not, coffins. Musically they were consistently solid at their peak, though never as original as those fans believed, having drawn their elaborate stage shows from eccentric predecessors such as Screamin' Jay Hawkins and contemporaries Alice Cooper and Parliament-Funkadelic. Yet seven Top 25 singles and 40 years scoring hits on various charts with upwards over 100 million in total sales give them plenty of commercial success. Despite all this it took them a long time and many outraged complaints for the group to be nominated and even longer for induction, likely forcing the commercial tie-ins Simmons had hoped for to be put on hold more than once. The wait is over and the KISS Army can at last have their victory parade, sponsored of course with exclusive V.I.P. passes for those willing to shell out enough dough for it. The only truly uncontested inductee in this year's class, the obvious headliners and the type of act the Hall gears its entire awards ceremony around, hoping to milk the insatiable lust for their all-too-short careers into sustained interest. Their achievements need no embellishment, the trio were the face of the grunge movement that was spawned from alternative rock and dominated the early 90's alongside gangsta rap. They were the centerpiece of the suddenly vibrant Seattle rock scene and made the region a musical hotbed in their wake. Their music was powerful, their lyrics insightful, and for many alienated souls they stood as the voice of that generation. Their catalog, though thin in terms of output, spawned indelible anthems, numerous hits and some of the most acclaimed albums of all-time. Maybe most impressively Nirvana's influence and impact in not just rock music but culture at large was far-reaching and instantly identifiable. In tragic frontman Kurt Cobain they have a figure who remains, even two decades after his death, an iconic image, while their drummer Dave Grohl has gone on to front the continually popular Foo Fighters and become one of the most respected figures from all corners of the rock world in the ensuing years. No matter who else got in this year Nirvana would have overshadowed them, but the fact that they're the lone representative from their time period, one which was far more diverse and multi-faceted than the Hall voters seem willing to acknowledge, make their going in with such a weak supporting cast just one more tragedy in their legacy. But make no mistake about it, this year's inductions matter because of their presence. Each decade dating back sixty years now had a figure who had considerable commercial success by mining the hits of others, in the process churning out pale imitations of the originals which offered no new stylistic wrinkles, radical re-arrangements or even needed revivals of a forgotten sound. In the 50's it was Pat Boone, in the 60's it was Johnny Rivers. In the 1970's that role was filled by Linda Ronstadt. Thus far only one has made the Rock 'n' Roll Hall Of Fame, but that's one too many. Ronstadt took the hit parade of the late 50's and 60's and simply re-released it with a different name on the records. She was rewarded for it then when they became huge sellers in their own right and now she's being rewarded for it again with an induction in spite of the fact that none of the songs that got her here are the defining versions! Virtually all of her biggest hits were iconic songs from even more iconic singers. Roy Orbison, Chuck Berry, Buddy Holly, Martha & The Vandellas, Smokey Robinson & The Miracles, Little Anthony & The Imperials, The Everly Brothers, The Rolling Stones. All Hall Of Famers themselves, yet all with mostly original material that dwarfs Ronstadt's output in that realm. Sure, she'll get and deserve some credit for having the group that became the Eagles backing her and her own early country-rock forays with them played a role in that particular thread of the style's ascent to mainstream popularity, but that's not enough to warrant this honor. In the end she was a pretty face with a pretty voice who was a formulaic artist offering very little in the way of new ideas, but the Hall has shown that when it comes undeserving candidates that is often more than enough. More than any of this year's inductees Stevens represents the inherent flaws in the current demographics of both the nominating committee, most of who came of age when his career peaked and thus constantly look to confirm that era as historically valid by offering them up for induction in the first place, and the voting body at large, a sizable percentage of which were either his contemporaries or members of the rock press who covered that time and still look back fondly upon it. While he had some success, 6 Top 25 hits, along with a string of Top Ten albums, his most notable hits were even bigger on the Adult Contemporary charts, hardly a rock pedigree to brag about. Though he later explored synth-pop with some success, overall he had no influence to speak of, as he was a simply a good folk-rock performer who traveled the same musical road as so many others before. His most significant cultural impact came when he converted to Islam and abruptly stopped performing, and most of his ensuing moments in the public eye came from his work in humanitarian causes. Though he was a well-regarded songwriter and reasonably familiar name the mark he left on rock history, while not invisible, was insignificant compared to virtually all of the others on this year ballot, not to mention a hundred others still waiting induction. That's not a slight, his achievements are still better than most who dream of stepping into a recording studio, yet they certainly are not equal to the credentials of six others who failed to get in this year and that's the entire point of a Hall Of Fame. To separate the greats from the merely good. It's hard to put down a man who implored people to ride a Peace Train, but it's even harder to comprehend the logic behind his induction. In 1999 when Bruce Springsteen made it in on his first year of eligibility there were those who complained the Hall should've included the famed backing group he'd employed for the majority of those years, The E-Street Band. Arguably there was no group who were as much of a part of the overall musical and spiritual journey its leader steered them on than that collection of Jersey wharf rats and yet they were left out, only receiving Bruce's heartfelt invitation to join him on stage to share in the honor bestowed on him. Well, in that particular case the Hall got it right. Not that the E-Street Band wasn't deserving of receiving credit, just not official credit as per the Hall's own bylaws, which state that in order to be eligible you need to release your first record under that name 25 years earlier. Springsteen, though he'd recorded with the E-Street Band from the start, did not officially credit them on a release until 1986's triple-LP live boxed set. Hence, they weren't eligible until recently. Now that they are, and now that the Hall has taken to revisiting past inductees backing groups for current enshrinement, their credentials hardly need explanation. They were accomplished and versatile musicians as well as a peerless and indefatigable live act, and they'll rightly join their acclaimed frontman in the Hall. Whether the circumstances surrounding their induction is appropriate is another matter entirely. Considering Steven Van Zandt's longtime presence on the nominating committee, the conflict of interest is glaring and one can also see the Hall's machinations at work to produce a memorable show featuring one of their personally favorite groups. Regardless of the circumstances surrounding this, the band are among the best to ever step on a stage and will be a welcome addition. In this category, The Rock 'n' Roll Hall Of Fame has routinely ignored the contributions of legitimate skills related to music to focus on, reward, or perhaps pay off, the powerful industry insiders who keep the checks coming. When they do turn their attention to non-label owners it is too often to celebrate a person associated with somebody the committee adores. This year is no exception as they continue to romanticize the 60's British Invasion by inducting two names who figure prominently in that story. As manager of The Beatles he deserves credit for a few key things. His persistence in getting them a recording contract which got them out of the sleazy pubs they'd been playing in and gave them an opportunity to be heard by a broader audience. He also was vital in reshaping their image from one of rock 'n' roll rebels to neutered pop singers initially, which helped them gain entry into the mainstream quicker. But once there it was the group's irrepressible wit, charm and personalities, along with their prodigious musical abilities that allowed them to hold that audience. That and, in America anyway, the death of President Kennedy which had the entire nation longing for an escape, preferably one with no ties to the America that had just endured a shared tragedy. Fortuitous circumstances aside, Epstein's handling of their career from a business standpoint was in some ways downright disastrous for the group. A novice manager, the royalty rate he secured them was alarmingly low, on top of which he signed away the Lennon-McCartney publishing rights for a pittance and did all this for a fee of a whopping 25% of their income, even going so far as to deduct his own expenses from their shares! Even the other acts he managed, Gerry & The Pacemakers, Cilla Black, Billy J. Kramer & The Dakotas and The Cyrkle, all benefitted immensely from Epstein's access to Lennon-McCartney songs, which formed the lion's share of their hits. Like Colonel Parker with Elvis Presley, there was some organizational acumen he provided which helped propel his clients to greater success, but it's obvious that it was more his notoriety as "The Fifth Beatle" and the Hall's obsession of the group and the era, that secured him an induction. The other half of the British Invasion resuscitation taking place at the Hall this year goes to a slightly more musically worthy recipient. Oldham was the de facto producer for the Rolling Stones during much of the 60's, but debate over his contributions in the studio remain contentious decades later. Much like Epstein with the Beatles, Oldham's role mainly consisted of a few notable decisions, oddly enough inspired largely by a belief that to best succeed the group would have to be presented as the polar opposite of their famous predecessors. Oldham played up the Stones image as bad boys, garnering instant notoriety by pitting them as the Beatles rivals who possessed an edge the Fab Four lacked. Most crucial to the group's success, musically and monetarily, was him pushing for Mick Jagger and Keith Richards, who'd previously been content to cover songs of their idols, to write their own material and then he smartly had the group retain the rights to their masters, which was hugely profitable down the line. Whatever the true nature of his role in the studio with the Stones, Oldham did take on creative roles with others, none of it very successful commercially, though much of it interesting creatively. As for his induction now, while not without some merit, perhaps the most telling fact is that in the last decade he's been hosting a program on satellite radio courtesy of the ubiquitous Steven Van Zandt, for whom nepotism is not just a yearly duty but a cherished privilege. When you study the nomination and voting process in depth you begin to question the logic of having the same small handful of names making the selections each year. You start to see the inherent flaws in having a demographically shallow pool of voters who overwhelmingly represent the same basic era, background and experience. You grow incredulous at the Hall not insisting on any reasonable guidelines to emphasize objective achievement and criteria based analysis when issuing ballots. Most of all you shake your head in sheer wonder at how the same fundamental failure to accurately portray rock history keeps occurring year after year because of these blatantly obvious issues. Now atop all of that organizational incompetence add to the mix an unsettling racial element which threatens to disavow the massive cultural shift that rock 'n' roll initiated by bringing black music into white society, allowing it to shamelessly intermingle and cross-breed until the idealized musical melting pot was a reality. 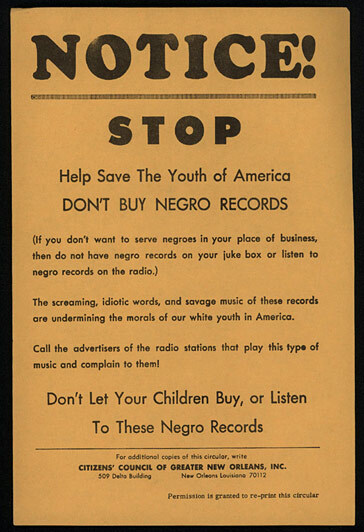 That was rock 'n' roll's most audacious affront to the establishment, promoting and celebrating a musical miscegenation, and yet today the Hall Of Fame's voting structure virtually ensures that rock history is being effectively re-written to represent, more and more, the type of music and society that rock originally challenged and succeeded in changing. Now it seems they want to change it back.